This week has been a whirlwind of both weather systems and emotions, and like everything at the moment it has me thinking about Tricky and his future. Hubby and I had a very short trip down to his home town of Albany for the funeral of his music teacher, friend and mentor, Peter Rasmussen. Mr Ras (rhymes with jazz) was such an inspiration to everyone he met and his passion and great skill almost single handedly created the thriving music scene in the Great Southern - if I was to list the bands he was either in or was the conductor of, we'd be here for weeks. Such was this man's popularity with both young and old there had to be two officials directing traffic on the road to the church where his memorial service was held! The Albany City Wind Ensemble comprising some thirty plus members were on the stage (with sheet music and tissues on their stands) providing the music for the service including the most brilliant farewell song called “Instant Concert” (played when the pallbearers removed the coffin to go to the burial). 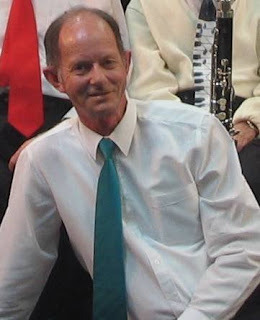 You have to hear the song to truly understand how brilliantly uplifting it was to say goodbye to Mr Ras with this song (the clip below shows the song being played by the South Australian Police Band) a fitting send off for someone with, I'm told a wicked sense of humour. Because that's the thing – I only met him on two occasions and didn't actually know him, I only knew of him through the countless stories told to me by Hubby and his friends. My first time meeting Mr Ras, I could see Hubby swell with pride to mention to his musical mentor that he had married a muso! The fact that I play saxophone and not the trumpet was quickly glossed over, as both Hubby and Mr Ras were partial to the brass. But I was a muso none the less, and I got Mr Ras' approval. I was thinking this as the music swelled toward the end of the ceremony and felt Tricky do somersaults every time the timpani was struck. When I mentioned Tricky's response to the timpani a wry smile crossed Hubby's face to be quickly replaced by a look of fake disgust when he whispered to me “Oh no, our child is going to be a percussionist!”. With musical parents Tricky will be exposed to many genres from birth, and I would love for him to experience as many instruments as possible. Its never to early to start I'm told, which is why you can get such tiny weeny little violins. So what do I wish for him? Other than the standard health, happiness and the hope that the teenage years aren't too atrocious, I do have little daydreams of him playing an instrument (normally the trumpet because that would suit my budget – we already have one!) and taking him to band practice, although the day dreams stop before I have to bake a cake to help raise funds for the next band trip. I'm not too sure of the reasoning behind these dreams – do I want him to follow in my footsteps as a way of confirming to me that I made good choices? Or do I want him to have those experiences because in my memories the ones with music in them are the best? Music opened up a whole new world to me and brought many friends and experiences not limited to “this one time on band camp” stories. The feelings of pride and accomplishment that would come when you'd mastered a difficult piece of music or won a prize in an eisteddfod were addictive. I suppose all I can wish for is that Tricky finds something in life that he has a passion for, be it music, sport, science, art or the thousand other fields he'll have to choose from. If he is anything like his father he'll be a strange mix of a few very different areas: science and technology, music and V8 motorsport. this is so sweet! I never met Mr Ras, but he sounds lovely. I do love a send-off that is more a celebration of life than sadness that someone is no longer with us. Until we meet again Mr Ras. You were my mentor and friend and you pushed me to see just how good I could be. I am like you. I dream of the day my kids come home and say mum I want to learn an instrument. Just a couple of days ago Kass informed me that she would like to learn piano and trumpet. She changes her mind constantly about which instrument but I'm so incredibly happy that she and Gabriel both seem to have the music in them :). Whether a school in my area offers a music program is completely swaying me as to where I'm going to send my kids. As it is I have Kass doing pre-kindy at the school she'll probably go to because I know they have an instrumental program. Mum told me about the funeral (still bummed I couldn't go) and it sounded so much like Mr Ras. Always caring and considering others and I love the fact that he chose music that would uplift people and have them celebrate his life rather than dwell on his passing.